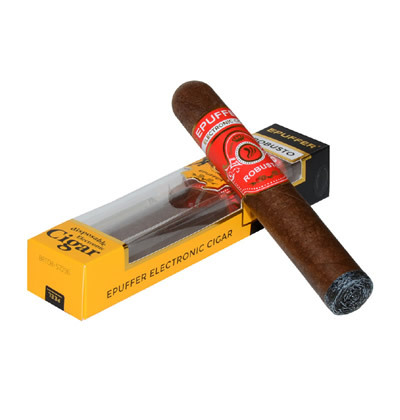 E-Pipe is a type of electronic smoking that has been patronized by the higher-ups, not only because of its positive health benefits, but also because of its premium feel and timeless classy looks. Introducing E-Puffer’s newest addition to their line of impressive e-pipes, the 609 E-Pipe! This new unit promises both the features and the functionalities of your favorite e-pipes and the classy looks that you have always loved! Pipe smoking is one of the oldest and classiest pastimes in the world. Pipes, especially wooden ones, are often depicted as a status symbol of the wealthy elite. Despite its historical popularity, it’s also undeniable that pipe smoking can be hazardous to your health. The amount of nicotine in every pipe smoking session can be thrice the effect of a regular cigarette stick. Fortunately, talented manufacturers came up of an innovation: the E-Pipe. 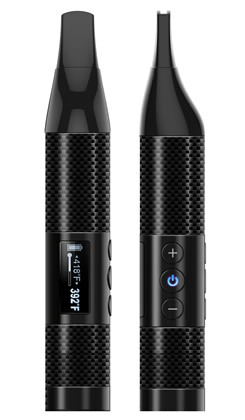 The new ePuffer Electronic Pipe 609 offers flexibility for vapers to use prefilled cartomizers, or an optional easy to fill E-Pipe 609 Disposable Liquamizer. ePuffer’s 609 E-Pipe outperforms other e-pipes in multiple ways: first, the 609 E-Pipe’s bowl is made from real, fine solid wood, upping to a whole new level the aesthetics of the product as well as the overall experience of using it. 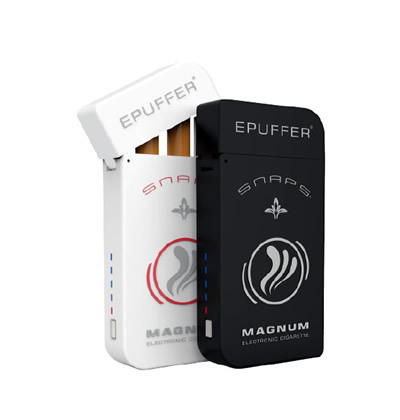 You are also secured of its power and performance - the 609 E-Pipe uses the same cartomizers as our E-Cigar 650, a acclaimed e-cigar unit in our line-up. It also presents an optional tank clearomizer, further making the experience customizable and personalized, to suit your needs and wants. The unit comes with a manual power button, further contributing to the ease of use of the product. It is also very light and can be brought and puffed practically anywhere, as it is smaller than its predecessor, the 605 E-Pipe. 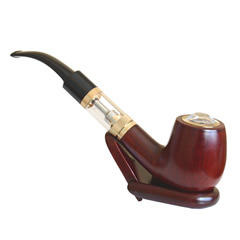 Become a true Sherlock Holmes with this magnificent pipe! The only request for the Epuffer, make Gandalf's pipe from the Lord of the Rings! I will buy it immediately if you do! Hi Sherlock ;) We have sent your request to our R&D Team! My dad used to smoke a pipe and so did I for a while. Then I gave up tobacco. I still enjoy the feel of a beautiful wooden pipe in my hand. The development of vaping, which I feels is still safer than tobacco makes enjoying a pipe again a reality. I still haven’t found the exact juice I want to use but the pipe is a keeper. I had an issue with the button, and customer support had a replacement in my hands in a few days. Unlike the pipe, the button is not well made as it could be. I’ll probably buy extra buttons so I can have different colors and spares. I bought this as a Christmas gift for my husband. He loves it! Very affordable epipe model. It works as good as it looks. Fast delivery in New York area. I reckon this has got to be, on balance, the best e-pipe on the market (I bought it a few days ago). I've smoked a traditional pipe for well over 30 years, and have tried several e-pipes in an effort to give up smoking. I've found that they all, without exception, have basic flaws: they're either too heavy (because of the weight of the battery in the bowl) or they're too long. If you combine that relatively long length coupled with the weight of the bowl and battery, you have a strong 'cantilever' action that, if you hold the e-pipe between the teeth only - that is to say without using a hand at the bowl - you're liable to loosen a tooth! But the length of the 609 overcomes this problem: it's shorter than most e-pipes - no doubt because of the cleverly designed, shorter, tank - measuring just 13.5cm from the center of the bowl to the mouthpiece when using a cartridge, and just 1.5cm longer (so around 15cm) when using the tank (as I prefer). So far closer to the average length of the traditional pipe. The weight of 125g is less than other e-pipes I've owned, though a little heavier than a traditional pipe fully loaded with tobacco. And I'm only guessing here, but I wouldn't be surprised if the reason for needing to touch the top of the bowl to start to 'smoke' - for that's what it feels like: smoking! - is because the action of the hand at the bowl definitely makes the 609 feel lighter than it would do otherwise. But all-in-all, THE BEST E-PIPE ON THE MARKET, ESPECIALLY FOR THOSE WANTING TO REDUCE OR GIVE UP THE TRADITIONAL PIPE SMOKING! HIGHLY RECOMMENDED!